Most of California has received less precipitation than average so far this Water Year (since Oct 1), and the Sierra Nevada snowpack is lagging even further behind (due to the relative warmth in the mountains). But the season is still young, and California’s winters are often “back weighted” such that more than half of precipitation falls during the second half of winter. So there’s plenty of time for things to turn around, and there is indeed some good news in the short term: a series of wet and relatively cool storms are headed for California over the next 10 days. 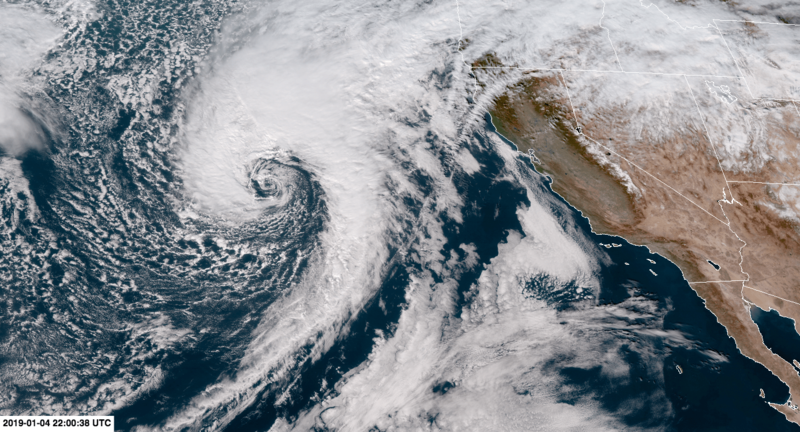 The strongest storm of the season thus far is rapidly taking shape west of the California coast this evening. A fairly deep surface low for this region (as low as 987/988 mb) will be located a couple hundred miles west of the North Coast tomorrow, and will be associated with a relatively strong cold front and locally strong, gusty winds. 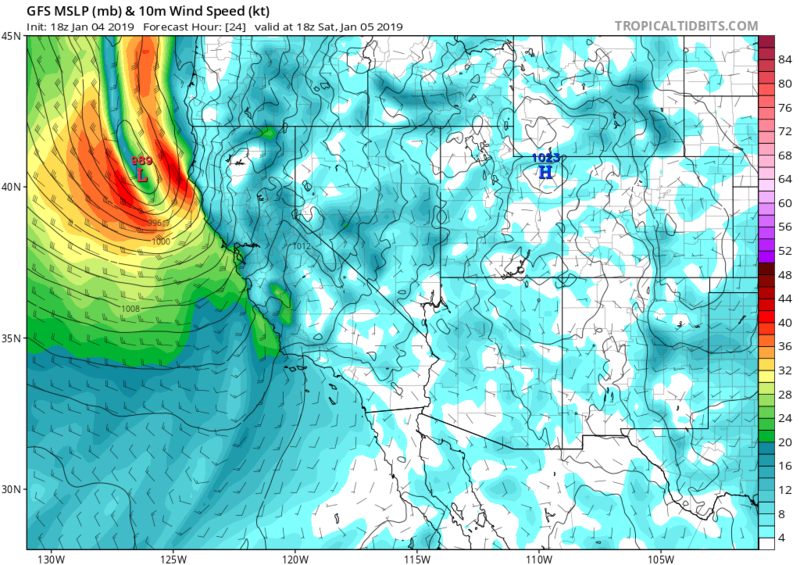 Despite the quite low surface pressure associated with this storm, it does appear that the strongest gradients will stay well offshore and are unlikely to produce a widespread major wind event across NorCal. That said, strong gusty winds are still likely in many areas (of a magnitude that is typically seen at least several times each winter). Precipitation accumulations are not expected to be especially heavy with this strong but relatively moisture-starved system, but the cold front will still be pretty dynamically strong and could be associated with briefly heavy rain rates, strong winds, and isolated thunderstorms. 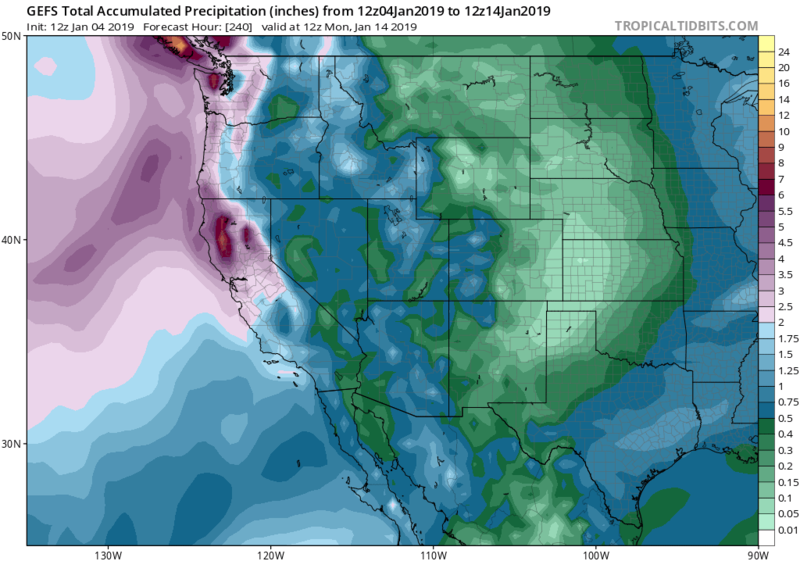 SoCal could still see a burst of briefly heavy precipitation with this weekend’s systems, but widespread heavy precipitation now looks unlikely there. There could be a few localized issues near recent wildfire burn scars, but this does not appear to be (at the moment) an especially concerning event. The Saturday storm will bring strong and gusty (but not extreme) winds to much of NorCal, esp. North Coast and Sac Valley. Perhaps the best news about these incoming storms is that they are associated with a relatively cool airmass. It won’t be especially cold, but temperatures even slightly below average have become an increasingly rare occurrence in recent California winters. As a result: widespread significant snow accumulations are expected down to relatively low elevations (locally 4000-5000 feet in some locations). Thus, the substantial snowpack deficits that currently exist may be significantly (but not completely) mitigated by this time next week. Fingers crossed! El Nino update: the Pacific is still really warm, but the atmosphere isn’t responding in kind (likely because the *entire* equatorial Pacific is warm, not just the eastern portion). Thus, the waiting game continues. A curious feature closer to home: a tropical/subtropical storm may develop just west of Mexico’s Pacific coast in the next few days. While that would not make news in July, that would be (as far as I am aware) unprecedented in January–a time of year when tropical cyclogensis is very hard to come by in that part of the world. This system is unlikely to be consequential for California weather in the short term, although there is a slight chance that it could increase the potential for entrainment of subtropical moisture in some storms slated to move through later next week. And what about the much-discussed polar vortex split? Well, it’s finally happening. And it may well have implications for California weather in the coming weeks, but it’s still hard to say exactly what those might be. There has been a lot of variability in long-range model outlooks in recent days, likely tied to uncertainty regarding whether the vortex would split and whether this stratospheric disruption would propagate back down into the troposphere (where we live). Time will tell!